Hello, friends, it looks like sources have confirmed exactly what we expected all along: that Chris Christie, history’s saddest gargoyle, is one of Donald Trump’s top picks to be his vice-presidential running mate. 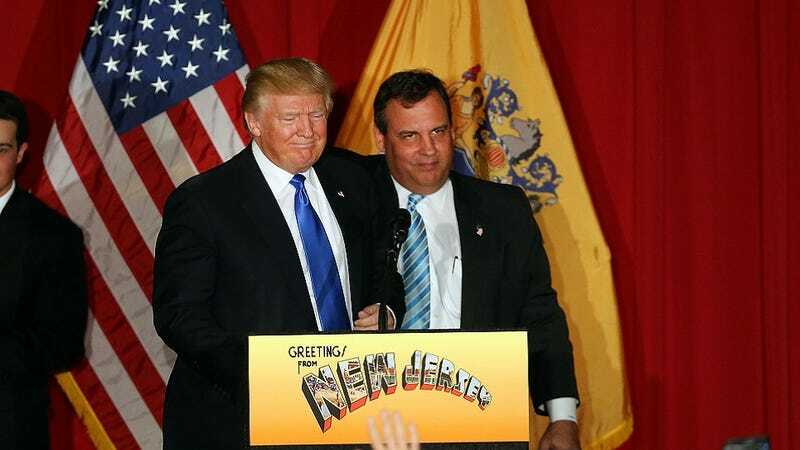 Unfortunately, we have still not confirmed whether Christie is in possession of his own brain, or whether it is kept in a secret catacomb underneath the Trump Hotel in Las Vegas along with the cryogenically frozen bodies of his lesser spawn. Besides the New Jersey governor/shambling sack of crushed Lays chips, former GOP presidential primary candidate Newt Gingrich has also been reported to be top of the pile. Oh, and Newt—he’s “still being considered.” Good for you, Newt. You did something. The Washington Post also noted that Alabama senator Jeff Sessions and Tennessee senator Bob Corker were mentioned for consideration, but other sources have claimed that this is false. But let us pause—because if indeed Chris Christie is in full retention of his faculties and has still not run back down a turnpike to the Garden State and straight to the other turnpike he lives under, how could everyone’s favorite marigold-hewed upside-down bumblebee hind have somehow convinced Christie to run on a ticket with him? I personally imagine that Trump ensnared Christie by whisper-singing the words to Barbra Streisand’s “Evergreen” delicately into his conch-shell ears. Then again, my colleague Patrick Redford said that “he probably just frowned at him really hard and made fun of him for being terrible at softball,” so I digress.